I’ve tried something like this in those Hong Kong style cafe. 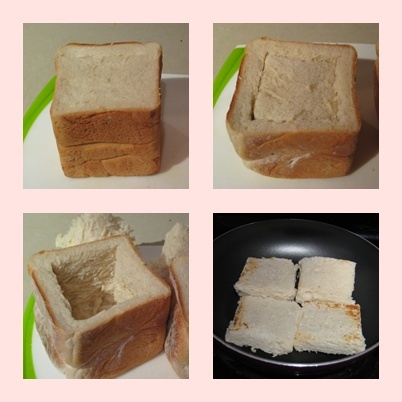 I always wanted to try to make it, but then, I couldn’t find unsliced bread. Until few days ago I went to Cobs, I saw that they sell loaf of bread unsliced. Then I bought a loaf home and made this dish. 2) Heat up a frying pan, put all the vegetables in and cook until soft. Add the cream of mushroom in, stir. I didn’t add any water, because the mushroom I used released enough water to make the soup thin enough. You can add milk if you want. Let it simmer for 10-20 minutes. Add corn in the last 5 minutes. 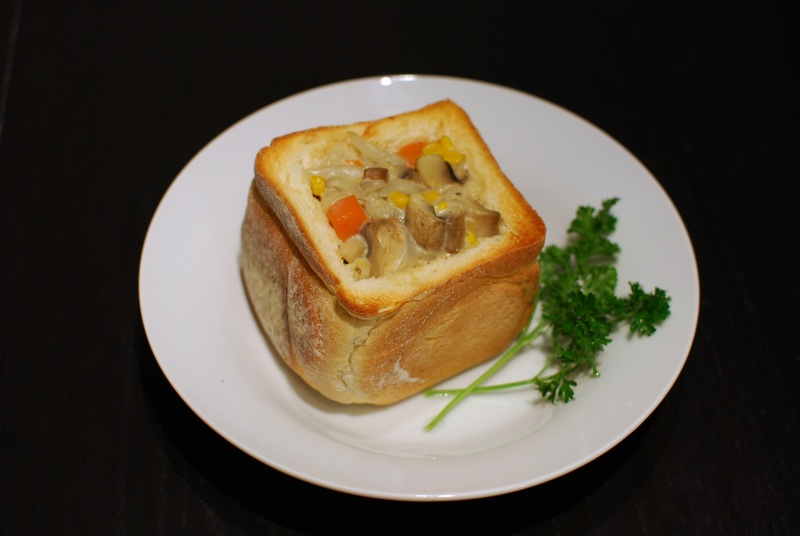 5) When the stew is ready, put the stew in the bread bowl. If you have shredded cheese, sprinkle them on top of the stew. 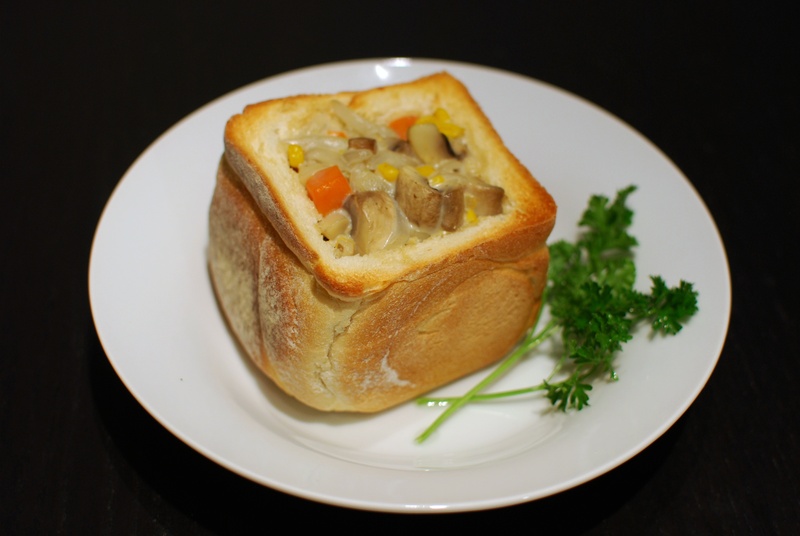 6) Bake the bread bowl until the cheese melts. 1) It’s pretty easy! hehehe! Me and Mr. Clam both liked it. Easy enough. Next time if I have time I think I’ll make the stew from scratch instead of using canned soup. 2) Since now I know that I can buy unsliced bread, I think next thing I wanna try is those super thick toast that you have at Taiwanese bubble tea places! 🙂 I’m gonna look for recipes now! I got 2 new bowls as presents a while ago, and I have always wanted to use them. Well I was thinking of miso soup this morning… so I decided to make miso soup for dinner. And… FINALLY! I got a chance to use my new bowls! 🙂 hehe! 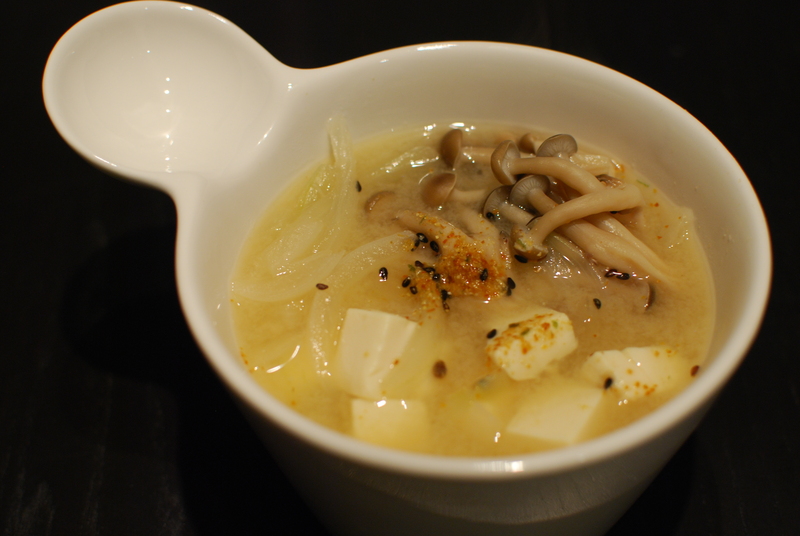 I won’t write too much about this recipe coz… it’s only miso soup, nothing fancy. You can pretty much follow the instruction on the miso package that you buy. You just throw in whatever you like into the soup. This particular soup that I made, I put in onions, mushroom and tofu, boil for a while, and then sprinkle the 7-flavour powder on top for more flavour. 1) Wash the asparagus. Boil a pot of water, and boil the asparagus until cooked. 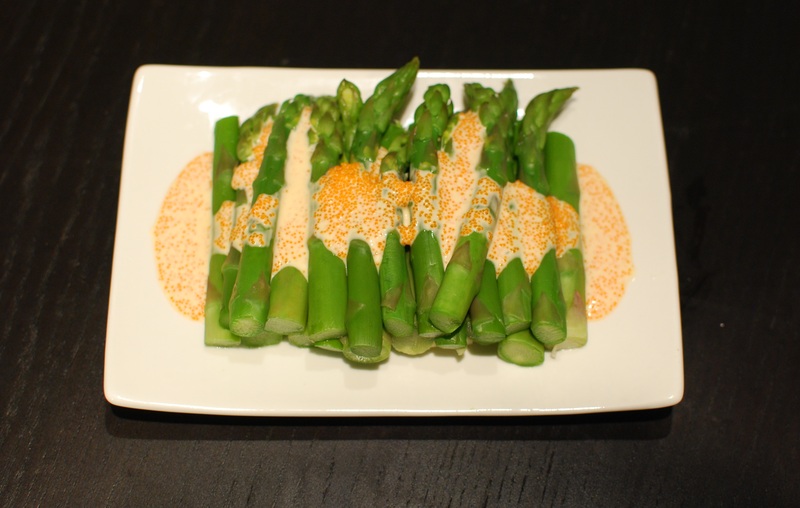 Cut asparagus in half. Place in a plate. 2) Mix the Japanese mayonnaise, lemon juice and masago together. 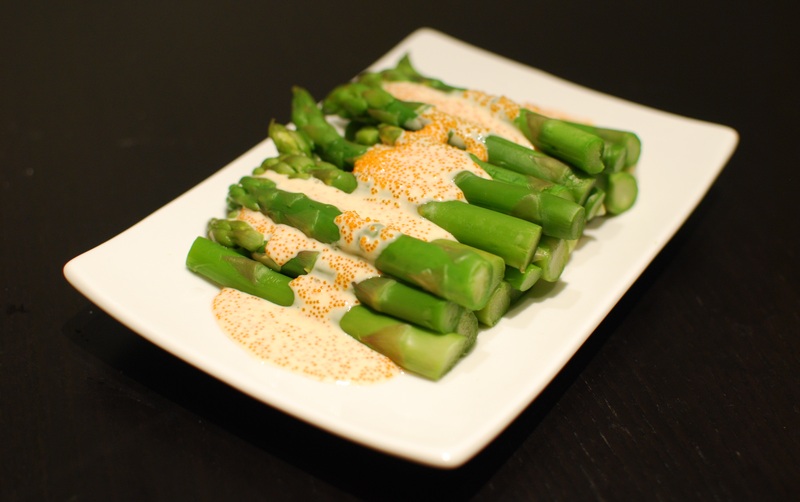 Pour the sauce on top of the asparagus. 1) It was really quick! I think the whole thing took me 5 minutes. And it’s really yummy! 🙂 Love it! I loooooove gomae! When I go to all-you-can-eat… I can easily eat 5 gomae. Thanks to my co-worker, Ms. Cat Slave, who lent me her grinder, I can make the sesame sauce. And with the sesame sauce, I can make GOMAE! hehehe! 1) Wash the spinach, then boil until soft. 2) Sqeeze out water with paper towel or clean cloth. When it’s dry enough, cut the spinach into desired length. 3) Put the spinach in a plate. 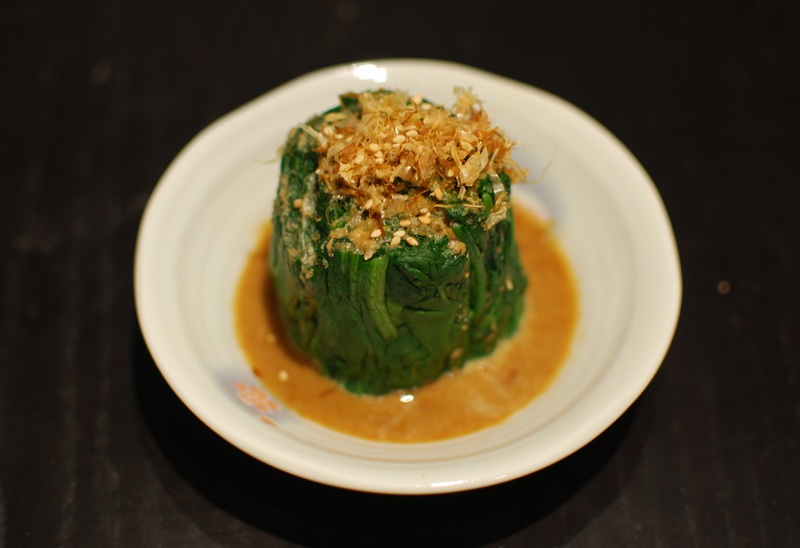 Put the bonito flakes and sesame seeds on the spinach, then pour the sauce on the spinach. 1) I thought one bunch of spinach would be enough for me and Mr. Clam… ended up, one bunch of spianch is not a lot after you squeeze the water out. My Kimchi is done! Please refer to here for the ingredients and recipe. 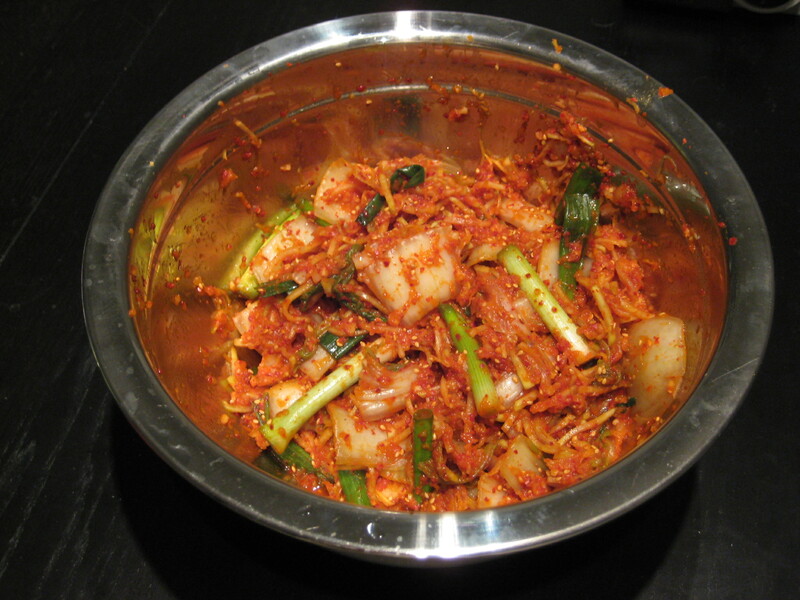 2) like Kimchi! hehe! It actually tasted pretty good! 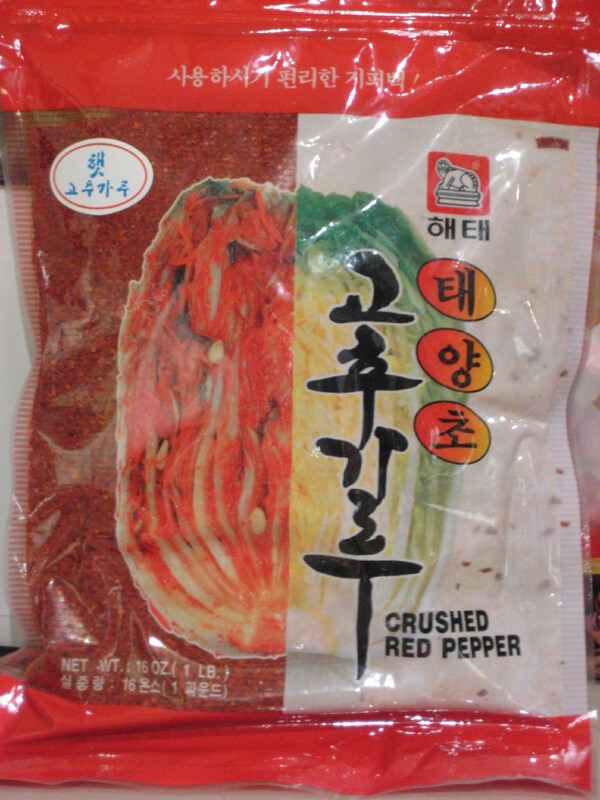 The only thing is… it’s a little spicier than the kimchi that I usually have. I think next time I’ll put less chili powder in next time. 4) I’ll try another batch after I finish this one! Hehe! I’m just so excited!!!! 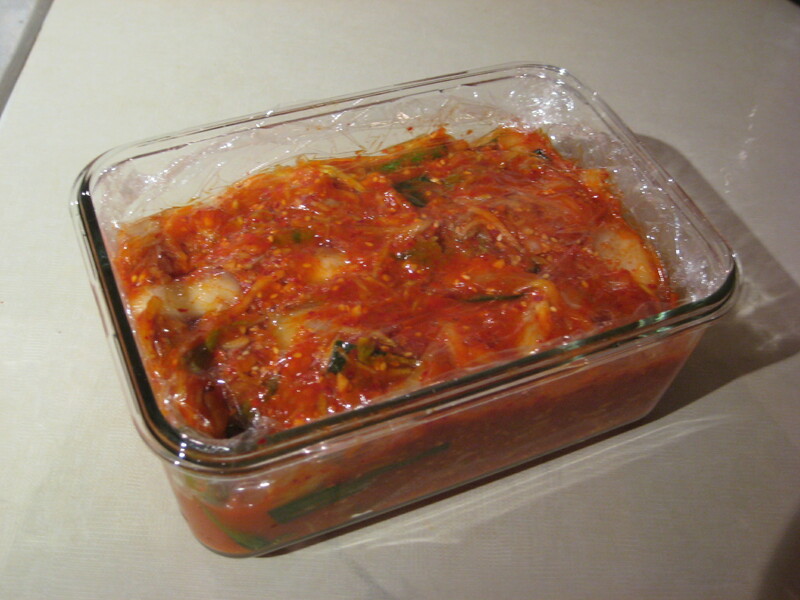 I saw a few Kimchi recipes on a few blogs a while ago. I never knew that I could make Kimichi at home! So after I saw those recipes, and knowing that the ingredients are quite accessible, I decided to give it a try. I modified the recipe a bit (because I don’t have some ingredients), but hopefully it’ll still taste good! 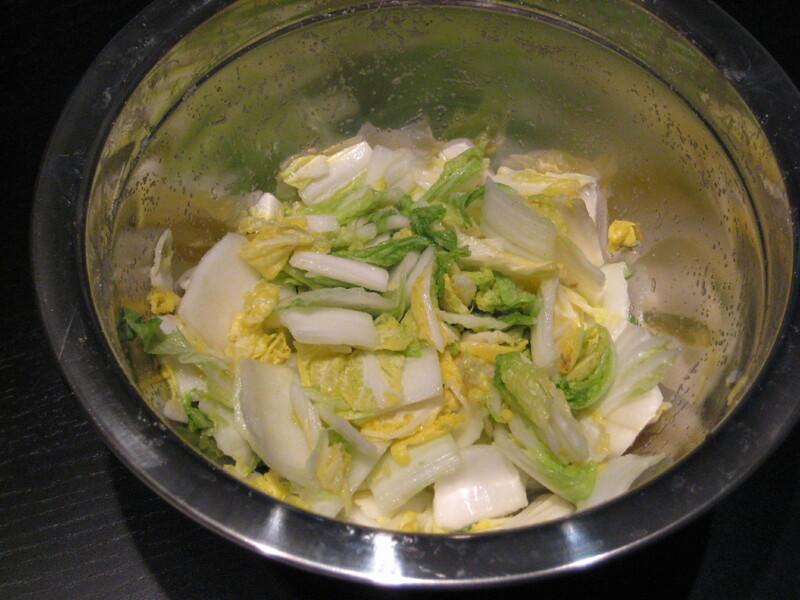 2) Put the cabbage into a big bowl, sprinkle the salt onto the cabbage. Mix the cabbage and the salt together until the cabbage leaves are soft. I think I left the cabbage in the big bowl for roughly an hour. 3) Wash away the salt from the cabbage leaves. Taste the cabbage leaves (the acutal leaf part) and see if it’s still salty. Keep washing (or soak the cabbage in cold water) the leaves until it’s not salty. And then air dry the cabbage for about 2 hours. 4) While you’re drying the cabbage, it’s time to prepare the other ingredients. 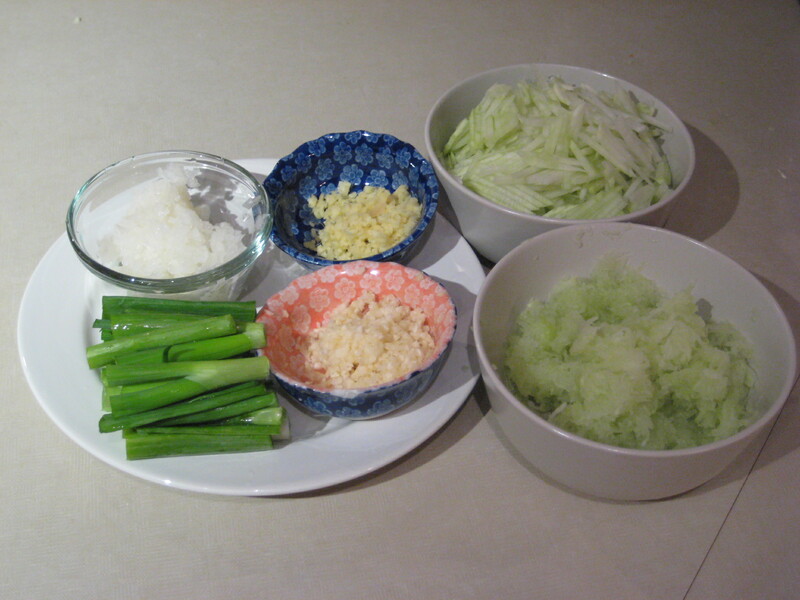 Cut the green onions into 2-inches pieces. 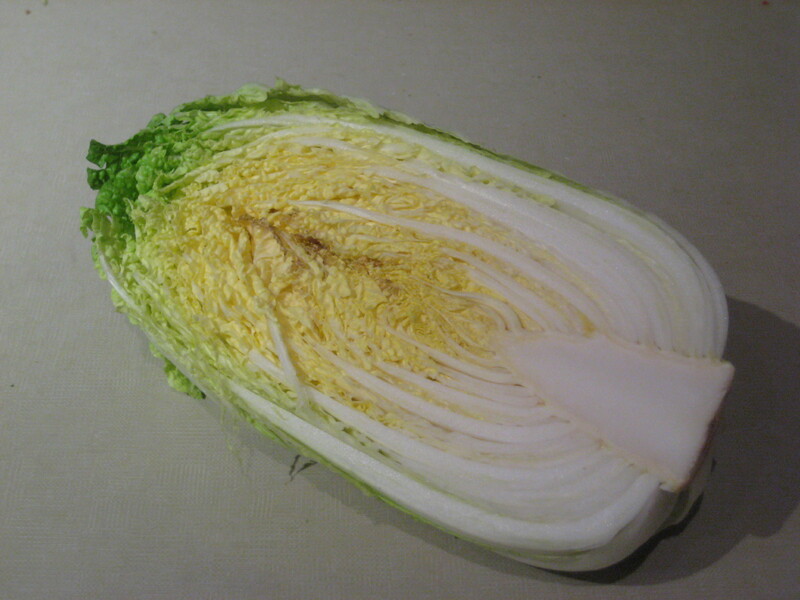 Cut the Korean raddish in half. Grate half of the radish, and thinly slice the other half of the raddish. 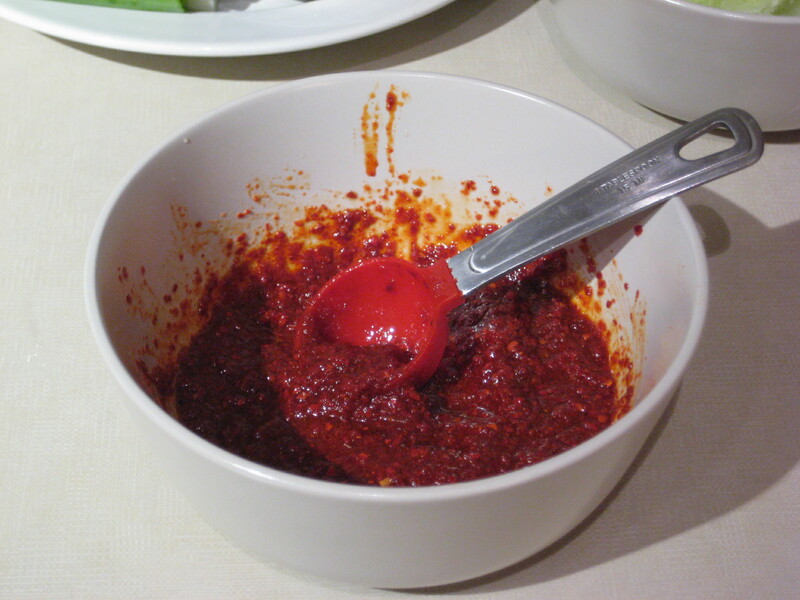 5) Mix all the Kimchi sauce ingredients together in a bowl. Taste it and see if you like it. You can add more crushed red pepper if you like it really spicy. 6) When the cabbage leaves are dry, then you’re ready for the mixing! Simply put all the ingredients in a biiiiiiig bowl, and mix them together. Mix them well! It’ll start to look like kimchi. 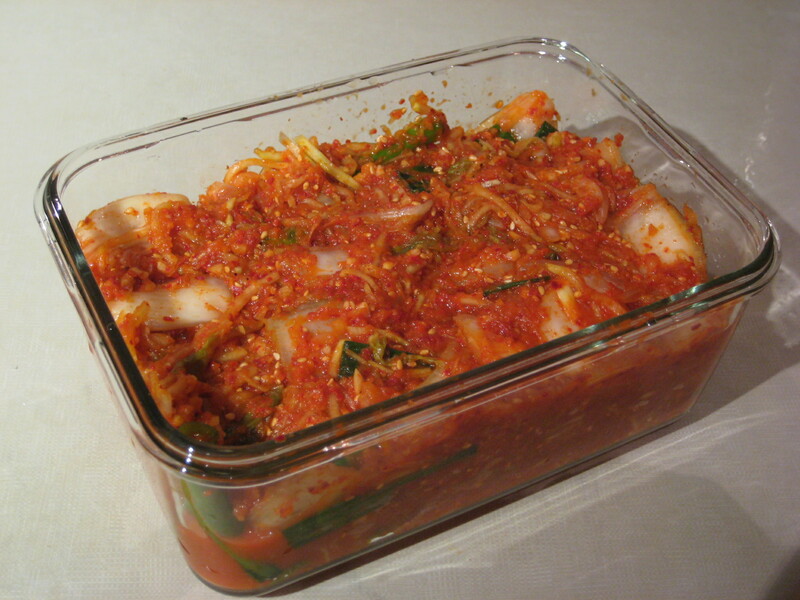 7) Put the mixed kimchi in a container. 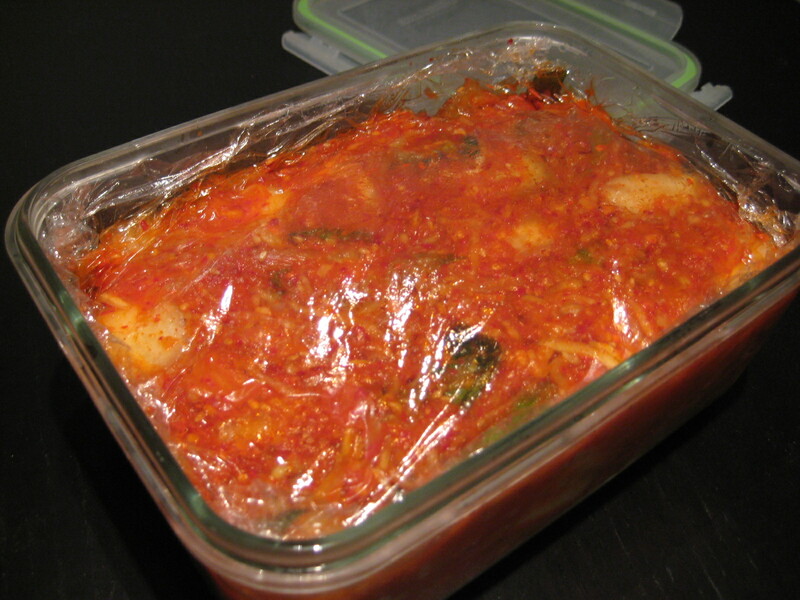 8) Put saran wrap on top of the kimchi. Cover the lid, then put it in the fridge for 7 days. It’s not ready yet! I’ll post it again after 7 days… but… OH! I’ll be out of town… so maybe I’ll post it after I come back… hehe! 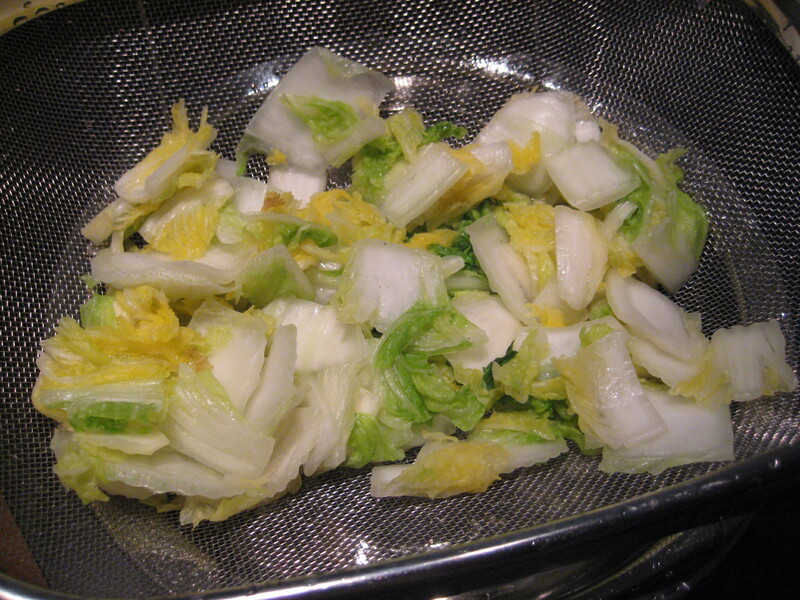 1) I didn’t know that the leaves would shrink so much… I think I should’ve used ONE whole cabbage instead of half. 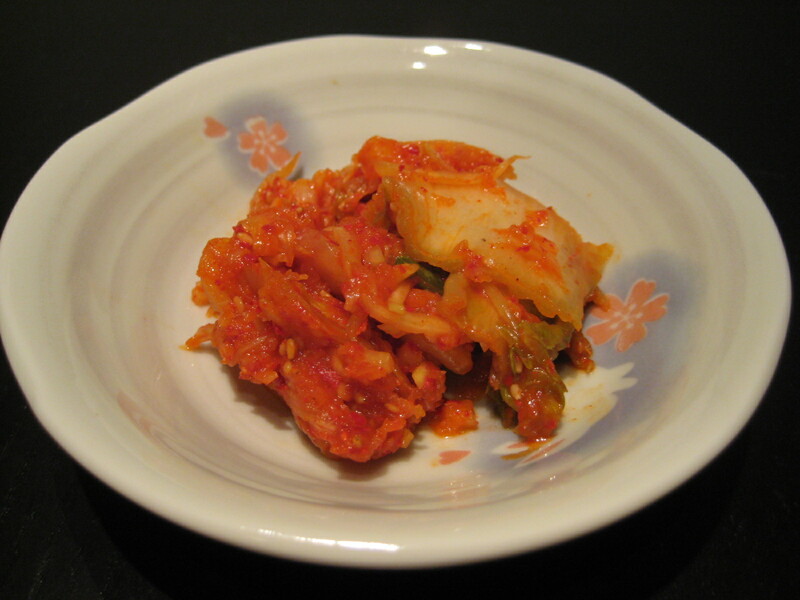 2) I saw in a recipe that you can add shrimp paste in the kimchi sauce as well. Too bad I don’t have it at home! I really like the smell of shrimp paste. 3) You can also add grated apple, thinly sliced cuccumber, and thinly sliced carrots in the kimchi as well… I don’t have it at home. But I’ll definitely try them next time! I tried to make the Daikon Cake again. This time I tried it with Rice Flour:Corn Startch 2:1 ratio, but then… it turned out to be quick firm. Still not the texture I want. BUT! Since this is so firm, it’s actually quite good for stir frying. 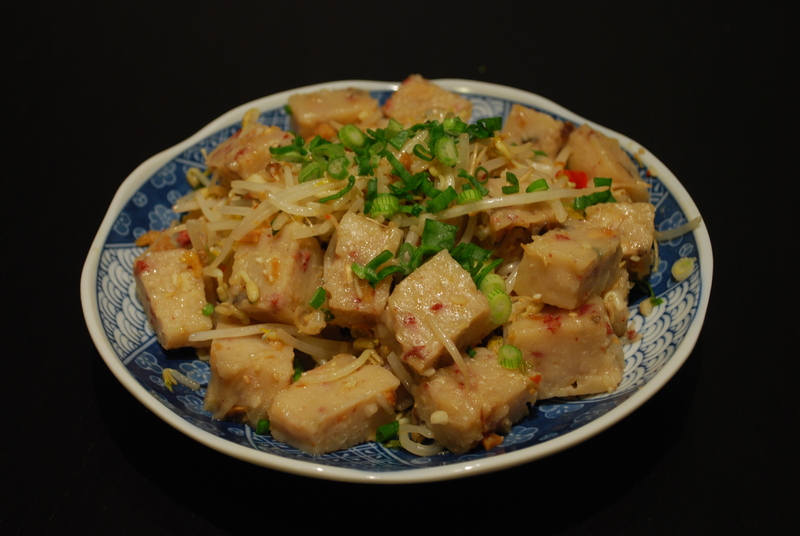 So today I tried stir fry daikon cake with xo sauce – a common dish now in many dim sum restaurants. 1) Cut the Daikon Cake into cubes. 2) Heat up a frying pan, then some oil, and then add the chopped garlic. When the garlic turns golden brown, put the bean sprouts in and stir fry for a bit. 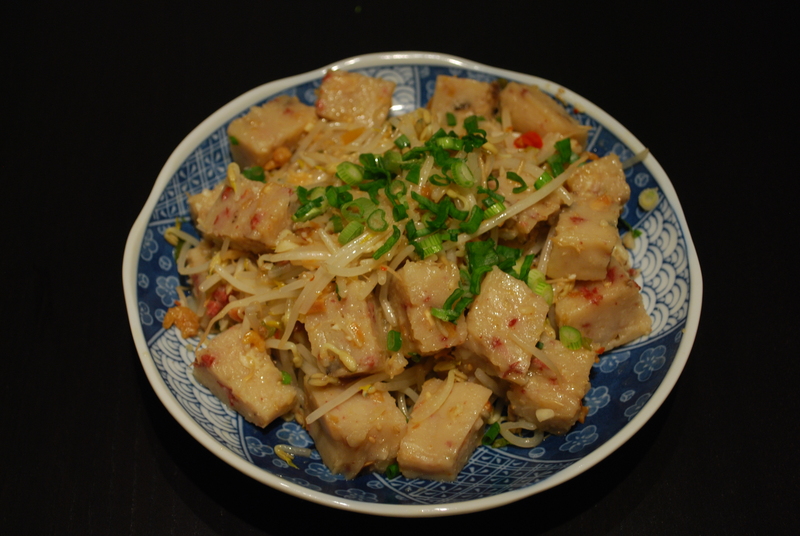 3) Put the daikon cake in and stir fry with the bean sprout. Then put the XO sauce in. Add salt and pepper to taste. Mix well. 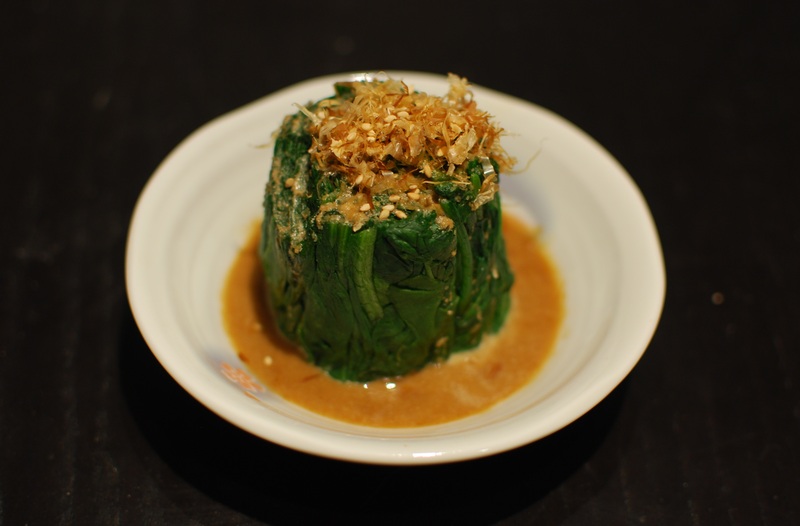 4) When the daikon cake is well cooked, put everyone on a plate and sprinkle grenn onions on top. 1) Just in case you didn’t know what XO sauce is, it’s a seafood sauce that’s usually made of chilli pepper, dried scallope, dried shrimp etc. It’s usually spicy. You can find it in most Asian supermarkets. 2) I think I put too much oil from the XO sauce in… so the whole dish turned out to be quite greasy. Not good. 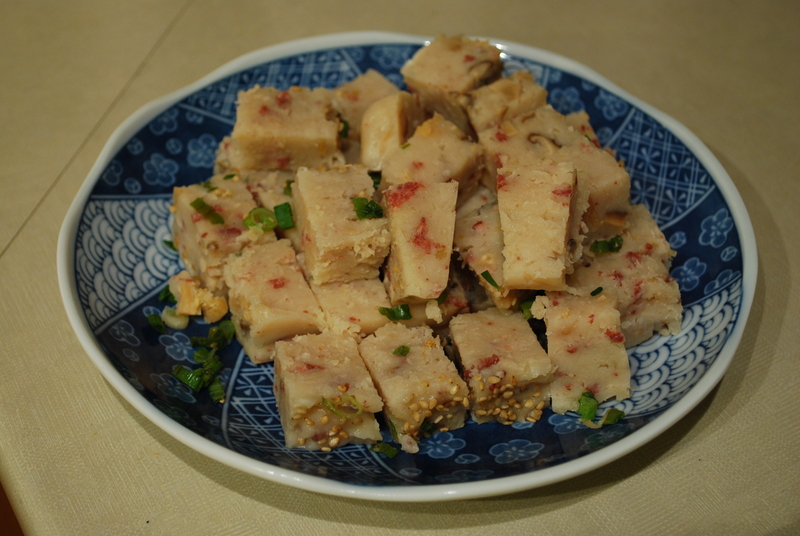 3) Hmm… About the Daikon Cake I think I’ll try a Rice flour:Corn Starch 3:1 ratio… Wish I’ll succeed next time!